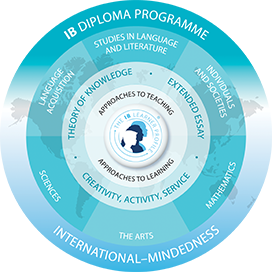 The International Baccalaureate Programme (IB) is an internationally recognized pre-university program, known for its challenging curriculum that develops critical thinking, spirit of inquiry, exceptional written and oral communication skills, and global perspective. IB courses are characterized by an emphasis on depth over breadth, requiring students to question not just their answers, but indeed question their sources. At MCDS, students benefit from IB curriculum through multiple pathways that satisfy each student’s personal goals, which may range from earning a full IB Diploma to taking select IB classes. All 11th and 12th grade courses at MCDS are IB courses, ensuring a thorough, well-rounded college preparatory education for every student. Study and take exams in six academic areas: English, Mathematics, History, Science (Biology and/or Chemistry), World Language, Art or Music. Complete a minimum of 150 hours of extracurricular activities with the purpose of “Creativity, Action, and Service” (CAS).